One of the *Always and Nevers* that we used at my Dental Practice was that we never pointed or directed. We always showed the questioner and led them exactly to where they needed to go. Be they patients, or be they team members. Our response was always the same. It’s exactly the same at Disneyland and Walt Disney World. Walt Disney realised at a very early stage in the development of these theme parks that there would always be guests who were lost or unsure of directions who would seek out and need guidance. would have the ability to take the guests to their destination. What Disney found was that the category of employee that guests sort most directions from were the park cleaners and litter collectors, and so it was vital that these cast members were trained to add value to the guests’ visits whenever they were called upon for directions. It would not be good for the Park if guests were made to feel as if their directional enquiry was a serious and unwanted interruption to the duties of the employee that they asked. In a similar manner, I am now noticing when I ask at more and more retail stores and grocery outlets that the employees are now leading me to the product that I am in search of rather than simply just telling me that it’s in Aisle Six next to the eggs. It is such a pleasure to be treated in this First Class manner rather than to be given some vague direction and then have to head off in hope that your latent pirate instincts will guide you safely towards your sought after destination. How many times has the opposite sort of “care” happened to you when you’ve made an enquiry at a business? I bet there’s been times when an employee at a business has left you with the feeling that you have asked the dumbest question ever? And that they have insinuated that you are so stupid that you shouldn’t be out without your carer? It’s not an answer that you would expect to receive from an employee when you seek a direction, but it is sadly, an answer that is often given when information is sought. This reply is about as unhelpful as you could get, I guess. These three phrases should be struck out of the vocabulary of all employees. This answer shows that the employee is a problem solver. Do you want them to be known as problem solvers? Or do you want them to be known as unhelpful and uncaring? The reactions of your patients and the feelings they are made to feel to these varied responses make all the difference in how your clients, customers and patients perceive your practice as being of service to them. It doesn’t matter how many implant society awards you have if your team members are being abrasive with your patients. 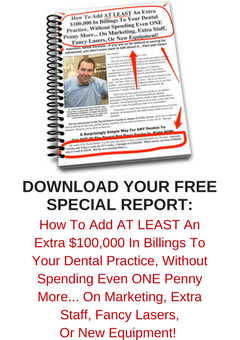 I’ve seen the dental businesses of some of the best clinicians and educators in the world suffer irreparable damage as the result of having untrained and uncaring employees dealing with their valued customers. And who wants to be known for that? In 1998 I had an employee who was so rude to my patients that they were leaving in droves. When we moved her on to another employment opportunity, and replaced her with a people person, my business skyrocketed. What’s going on at your business? How are your team members speaking to your patients? You Wouldn’t Keep A Championship Thoroughbred Racehorse And Have Him Out Ploughing The Paddocks On Your Farm, Would You? It’s Spring Racing Season here in Australia. And although I’m not one to bother with horse racing, I know there are several binding principles when it comes to getting results on race day. Those principles, as logical as they seem, are often ignored or discarded as common sense business principles when it comes to owning and operating a successful dental practice. You’d have to think this is logical. It makes sense in racing. You’ve got a great horse. Put the best jockey that you can on him. The best strapper. The best crew you can find. While I was in the UK in August this year, a dentist who reads my blogs religiously sent me a message asking if he could meet me for dinner, as he had seen on Social media that I had been travelling nearby to the city where he lives. This dentist and his wife then arranged to drive an hour and a half each way one night to meet with my wife and I for dinner. At that dinner, the dentist was telling me about a practice that he knew of, where one of the top-producing associate dentists was being very poorly utilised. It seems that at this practice, which operates seven days per week, the dentists who were coming in only once per week were getting to have the same chair every visit and the same dental assistant on each day that they visit. However, this was in distinct contrast to the fact that at this very same practice there were dentists working five days per week sometimes including across the whole weekend roster, who were far more productive and yet each shift they operated out of a different chair and worked with a different dental assistant. He said that the practice was not catering to its best performers while it pandered more to its under achievers. I consulted recently with a Dental Office where the three associate dentists all complained about the lack of consistency that they were experiencing because of having to work with different dental assistants at different moments. Not only from day to day, but even during the same day, and sometimes during the same one patient, during that day. It was no surprise that at this practice their numbers of patients failing to Pre-book ongoing treatment and failing to attend and keep any ongoing appointments were way off the charts! Another dentist I know of works at a Dental Office one day per week where he has a different Dental Assistant every week, ranging from a superstar down to the new girl who’s only ever assisted the hygienist and doesn’t know how to assist during a restoration, and doesn’t know where anything is. Sometimes this dentist says he gets the most inexperienced dental assistant to help for the day with his patients while more suitable assistants go about stocking cupboards…. If you owned a thoroughbred racehorse, you wouldn’t have him out ploughing the paddocks on your farm with the farm boy. Not if you wanted him to perform on race day. You’d have him living in optimal conditions and being ridden by those who care and those who can bring out the best in him. My dentist friend in England bemoaned at the lack of logic in that Dental practice he was telling me about, where it seemed that the owners’ attitude or mindset was that the high producing dentists can still perform well despite any hindrances before them, when in fact the opposite should be the rule. The high performing dentists should be allowed to practice their best dentistry in the most optimal consistent conditions. This would result in a Win-Win-Win situation. A Win for the dental practice because the dentist would produce more dentistry. A win for the dentist because he would produce more dentistry and operate in an ideal environment. And a win for the patients. Every one of them would receive much better treatment and much better care from a dentist happy in his environment. My dentist friend who works one day per week wonders at the ethics of the practice where he works that they take the same percentage out of his collections regardless of the standard of the dental assistant that they give to him? And the same question applies for that group practice as well? Do the very best for each and every patient each and every time and they will keep returning. After all, you have paid full price. You expect the best cast. In fact, you would demand it. And yet in some dental practices the owners must think that the patients don’t really notice these things. Or that if they do they simply accept them as being usual and customary. Well let me tell you, they do notice. And as customers, when they receive consistency in manpower, they feel far more familiar with their surroundings and where they do business than when it’s a “new face every time I go there”. Your patients prefer that consistency and familiarity. And your assistant dentists prefer it too. Creating that environment of consistency and excellence will reap rewards and benefits for all concerned. For your Dental practice, for your dentists, for your patients, and for your production. After all, consistency of delivery is the key to better results. Would you like to have me come speak at your meeting? Why Customers Venting On Social Media Is A Last Resort, And How To Avoid It Happening To You. Last month I wrote about a story that went viral down here when a woman was made to feel uncomfortable by a hair salon that she visited. And so the woman went straight to social media to “Name and Shame”, as she wrote. Because the poor little dear was feeling “Mortified” as she said in her Facebook post. Running to social media in that instant surely must have helped her feel better. As a result of her venting there was an avalanche of abuse launched digitally upon the salon. But interestingly, there was a reasonable amount of support for the salon. This is because all too often, in cases like this lady’s story, the business involved in the tale believes the sad plight of the customer and gets taken advantage of and gets left holding the bag…. My point in all this is that although the lady customer was made to feel uncomfortable for the predicament that she actually caused herself and put herself into, her public venting on social media could have had dire consequences for the salon, the salon owner and share holders and employees of the salon who were not directly involved in this lady’s predicament. As I said to one person, imagine if your daughter worked at that salon and then lost her job because of a marked downturn in business caused by this lady’s public venting. Yet your daughter had no role in that lady’s situation. The venting by this woman on Social Media created a barrage of abuse of this salon that was so disproportionate in relation to the incident. The abuse was also very “Lord of the Flies”-ish; it turned into online mob hysteria with hundreds of negative comments being posted on that salon’s social media pages by people who had never ever been to the salon. My point was and is, that there is a time and place to go to social media, and the way this woman did it was not the correct time and place. What this woman should have done was to contact the owner of the business to resolve her issues. This last weekend gone my wife and I travelled interstate, where she was presenting a workshop. And as usual, we booked into the hotel that we like to stay at, and where we do stay, most of the time, when we visit this city. On our arrival, at 3:45pm we were told that our room was still being serviced because the previous occupants had requested a late check-out, and that it would be ready in ten minutes. We were asked to take a seat in the lounge, which we did, happily. While we sat there, at least three bar staff asked us whether we would like a beverage. When we told one of these staff our story, they said they would check on the progress of our room. Now normally an afternoon beverage would have been quite welcomed, but my wife and I were hoping to quickly drop our belongings into our hotel room and then head off to pick up some booklets she had ordered and then take them to the nearby conference centre where she would be presenting her workshop the next day. So time was valuable to us at this moment. Well, twenty-five minutes later, we were still sitting in the lounge, unattended to, so we decided to approach the check-in counter to find out what was happening with our room. Our concern at this point was that because we were told ten minutes, then it needed to be ten minutes, and not twenty-five minutes and counting, that we were left alone and unattended. This time at the check-in we spoke with a different lady who explained that our room was still not quite ready. We asked whether there were any other rooms available for us. She informed us that we had booked a specific room, a workout room, and there were only two of these rooms in the hotel. Now, our booking was made through a third party organisation, and I could not remember requesting a “workout room”. At this point my wife and I were starting to air our disappointments at how long everything was taking, and how our check-in was being not so well managed. This second attendee then asked us to take a seat because she had “other guests to check in”. She did call for her supervisor, who came to us to explain to me that I had booked this specific “workout room”. We suggested that leaving us to sit for so long, considering the initial ten minute estimate, was not good customer service. Hotel check in is at 300pm. If the hotel is fully booked, as they told us they were, they should never have allowed the previous guest to have a later check out. When we mentioned that it would have been nice to have been offered a complimentary beverage while we waited, the manager suggested that the hotel would take care of any drinks that we had consumed. Trouble was, we did not have any while we waited, and even if we had have wanted to, we had no room number and account to bill the drinks towards. The manager said that something would be delivered to our room to apologise for the late availability of our room. She also pointed out that had I not booked through a third party, I would have received better attention. She suggested that next time I should contact her directly, and she handed me her personal business card. I’ve got to say, at this point I was not feeling as though I would ever return to this hotel. Our room, when we went to it, contained a full treadmill and a large gym ball and some weights. Talk about try not to notice the elephant in the room. I’d imagine that a treadmill might be OK if I was staying there on my own, but as a couple, its use would have certainly taken away some of the ambience of the room. The room also had a very large verandah attached, which was locked for us, and required us to contact security to open the door, if we needed to access outside. Anyway, my wife and I headed out to collect her booklets and drop them off to her conference room. To say we were disappointed with our hotel would have been an understatement. This is a hotel where we had stayed on many occasions. We had enjoyed the facilities of the hotel, and its central location. We had always felt welcome there. Despite one time our family was trapped in an elevator there for over an hour one visit. [And if I recall, the only service recovery we received on that occasion was four bottles of water and the kitchen was kept open for us for breakfast (that we missed because we were stuck in their elevator).]. On another occasion, I stayed in a room there where the room lights came on during the night, on a number of nights of my visit. Like at 200am in the morning. Hotel maintenance could not solve the issue at the time [in the middle of the night], nor could they solve the issue during regular business trading hours. When we returned from our errands, to settle down prior to dinner, a hotel staff member arrived at our door to deliver an ice bucket and a bottle of bubbly. This was a very nice gesture. When he left the room, we were surprised that the bubbly was a very inexpensive Australian sparkling wine. Needless to say the wine was not consumed. The next morning, after helping my wife get set up at her conference facility, I returned to the hotel room and noticed that a business card for the Hotel General Manager had been delivered with the Australian sparkling. When I Googled the wine I found it available at $7.99 per bottle. At this point I was definitely not feeling any love at all from our hotel. And at this point I could have done one of two things…. I could have gone to Social Media and blasted the ineptitude of the hotel. They certainly had dropped the ball on a number of occasions. But I liked the hotel. And I wanted them to make things better. I didn’t want to have to find another hotel to stay at. So, after finishing work that I had to do on my Mac, I decided to phone the General Manager and speak with her personally on my way out to lunch. She agreed to meet with me immediately. She was very appreciative of my contacting her, and working through our disappointments. She was very concerned about rectifying the negative events that my wife and I had experienced the day before. She promised to make good on the bucket of bubbly, with something more suitable. And she handed me another of her business cards and asked me to contact her personally when we next planned to visit and she would attend to our reservation personally. I left that meeting confident that things had been resolved. I felt much better about the outcome than any short-term pleasure I might have felt had I unloaded a barrage of abuse and disappointment on Social Media. And really, what would have been the point of any of that? I really don’t want to have to go and source out another one. Anyway, that afternoon, on returning from collecting my wife after her workshop, a surprise awaited us. There was an ice bucket. And there was French champagne. And there was nuts, And chocolate. Let me say this: Job well done. Why did I decide to give this hotel another chance? The reason is simple, and this is how it ties back in to your business. The reason that I went this way to seek a solution, rather than running to my keyboard like a screaming Nancy, is because I already had a significant relationship with this hotel. When I have already built up a significant brand loyalty, I’m not willing to throw that investment away for five minutes of fame associated with an abusive post or tweet. It’s because I am solution focused and not problem focused. At this moment I’m reviewing a manuscript for a book written on service. And I’m a little concerned that there’s a touch too much mention in the manuscript about complaints. The best way to deal with complaints is to prevent them from happening in the first place, and to have seamless service recovery protocols to swing into action when needed. The hotel and I are now onto the next page. Apology accepted, and very much appreciated. I do look forward to my next visit there….. If It Has Been Done It Can Be Done. One of the best feelings you can experience in life is the experience of showing people that told you something that couldn’t be done not only could be done, but that you did it. Despite the fact they said it could not be done. One of the greatest examples of this that I remember ever was hearing Zig Ziglar tell the story of David Lofchik. It’s a very motivating story of success through perseverance and unbridled belief. Success against and in spite of the opinions of others. In 2005 I lost some significant weight. One of my good friends later told me, years later, that he swore that I was going to put all the weight right back on again, and that he was proud of me for keeping the weight off. Although you may achieve success, there will be people, good people, who will bet against that success being permanent or long lasting. So with friends like that who needs enemies? Sometimes in business, sometimes in goal setting, you have to focus more intently on the result, and what achieving that result will do for you, rather than on the journey. For me, one of the major deterrents to putting weight back on was the admission of failure of having to buy larger clothes sizes. In fact just slipping out one hole on my belt was enough to cause me to have a conniption. Funnily enough, I never had any major aspirations about my book. My Amazon Best Selling Book “How to Build The Dental Practice of Your Dreams [Without Killing Yourself] In Less Than Sixty Days” was never intended to be more than an aide used in my coaching and my speaking. It’s success in its own right, as #1 on Amazon for most of the last sixteen months, has been nature’s way of telling me that I’m doing something right, despite the vindictive actions and puerile motivations of a handful of ineffective naysayers. You see, sadly, there will always be those who would rather see you fail than see you succeed. When you meet these people, move on quickly. Don’t be wasting your time with people like this. When I built my Dental Practice in working class Western Sydney, people were amazed at what I was able to achieve. My colleagues could not get their heads around the fact that I was able to build a high fee, high collections dental office in the heart of working class western Sydney, where people worked average jobs and earned average incomes and lived in average homes and drove average cars. As I teach those valuable lessons that I learned each and every one of the days of those twenty eight years that I was in that business, I am still amazed at the large, large number of people who still dismiss my success as an aberration unachievable to them. If it has been done, it can be done. Again. If there has been success once, that success can be repeated. It is up to us to learn from success we see, and not to be dismissive of that success as being elusive, or excusive. When I hear a success story, I always want to know as much as I can about what they did to achieve their success, to see whether I can learn from that person’s journey. I’m never envious of success. Success of others provides great lessons. Some people believe that the way to have the tallest building is to tear all others down. There are people out there who for some reason despise the success of others, and go out of their way to be a “black cloud” and even sometimes a hindrance. Keep well clear of them, they are a toxic road bump on the motorway of life that you need to stay well away from. There is more, so much more to life than what these “black cloud” people have to contribute. The joy we receive from helping others up is omnipotent. The pleasure received from helping others to succeed is powerful. The benefits of benevolence are invigorating. If Better Is Possible, Why Aren’t You Doing Better? One of the common themes that I see and hear about in Dental Offices with regard to providing Five Star World Class Customer Service to their patients is the fact that employees and owners and dentists know full well what to do and when to do it ….. but they do not do what they need to do when they need to do it. They know when they should be being helpful. But there are times when they are not. They know when they should be listening to their patient. They know when they need to be providing the Ultimate HandoverTM with their patient. And yet they do not. Each of these errors in behaviour are enough on their own to cause patients to want to go looking elsewhere for a different dental provider. It’s kind of like cockroaches…. As a homeowner, when you see one, you think there’s only one…. And there’s never only one tiny error being made. There are hundreds of them! The trouble is, most dentists don’t take the time to find out that they don’t know what they don’t know. Most dentists don’t even know when they are behaving badly. Most dentists don’t even know that employees in their practices are behaving badly towards patients. And yet these things happen and happen and happen. Often this behaviour is not done intentionally. It’s done because the team, and the dentist don’t even realise that there are better ways of doing things than the way that they have been doing things. A large number of behaviours in the Dental Office happen without a consideration. There is always a way to do things better. There is always a way to say things in a better way. Using better language, that sounds so much nicer, and is more polite, but still means the same. The difference between a good Dental Office and a Great Dental Office is that the great Dental Office is always refining, always improving. A great dental Office is always looking for a better way. A great Dental office never rests on its laurels. If better is possible then why are we not doing what is better? As much as is possible? Every time it is needed. Why are we allowing second best, if better is possible? Sure, near enough can be good enough. But not in a World Class Operation. In a World Class Operation, near enough is never ever good enough.